With three different rows, this pattern will give you a tad more variety while still preserving the simple mechanics and appearance of granny blankets in the round. Stitch wise, half double crochet (hdc) is used throughout to reduce stitch gaps and each row alternates with either two or three hdc shells. One of the most important changes is a ghost row of stitches without intermittent chain spaces or skipped stitches. This row stabilizes the structure of the blanket and helps to prevent warping and stretching of the corners. To make this row blend in, the following row is done in between the stitches to mimic the granny style. If this ghost row of straight hdc stitches isn’t for you and prefer all rows to be executed in the same classic granny square format scroll down for the alternate version. Tips: The center of the blanket starts as a circle and it is recommended that the magic loop technique be used for this starting round. The border detail is essentially an extended picot. To create a more triangular picot shape, replace the second single crochet in the chain loops with an hdc. 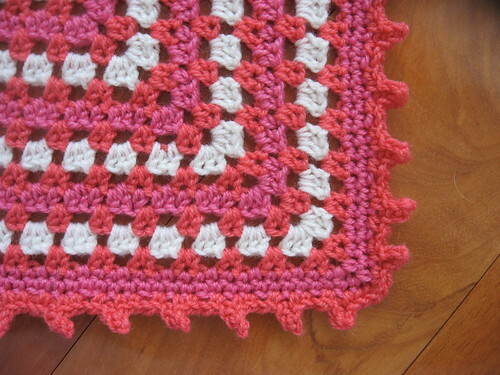 If the border curls, try turning the second row of the blanket and work a wrong side row. 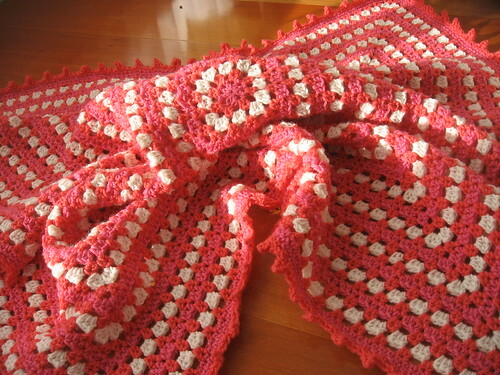 Check out the Through Any Window Baby Blanket CAL on Crochetville to chat with people who are making the same pattern! Have a look at the Through Any Window Baby Blanket Tutorial if you’re having trouble with either pattern version. Finished Size 30” x 30”, not including picots. With A, ch 3, join with a sl st to form a ring. Rnd 1: ch 3, *hdc in ring, ch 1, rep from * 6 times more, join rnd with a sl st to second ch. Rnd 2: with MC, sl st in to ch-1 sp, ch 2, hdc in same sp, *ch 1, sk 1 st, 2 hdc in ch-1 sp, ch 2, sk 1 st, 2 hdc in ch-1 sp, rep from * 2 times, end ch 1, sk 1 st, 2 hdc in ch-1 sp, ch 2, join rnd with a sl st to top of ch 2. Rnd 3: with B, sl st in next st, sl st in ch-1 sp, ch 2, 2 hdc in same sp as ch 2, *ch 1, sk 2 sts, (3 hdc, ch 2, 3 hdc) in ch-2 sp, ch 1, sk 2 sts, 3 hdc in ch-1 sp, rep from * 2 times, end ch 1, sk 2 sts, (3 hdc, ch 2, 3 hdc) in ch-2, ch 1, join rnd with a sl st to top of ch 2. Rnd 4: with MC, sl st in next 2 sts, sl st in ch-1 sp, ch 2, hdc in same sp as ch 2, *ch 1, sk 3 st, (2 hdc, ch 2, 2 hdc) in ch-2 sp, [ch 1, sk 3 sts, 2 hdc in ch-1 sp] to last 3 sts before ch-2 sp, rep from * 2 times more, end ch 1, sk 3 sts, (2 hdc, ch 2, 2 hdc) in ch-2 sp, ch 1, sk 3 sts, 2 hdc in ch-1 sp, ch 2, join round with a sl st to top of ch 2. Rnd 5: with A, ch 2, hdc in next st, hdc in ch-1, *hdc in next 2 sts, (2 hdc, ch 2, 2 hdc) in ch-2 sp, [hdc in next 2 sts, hdc in ch-1] to last 2 sts before ch-2 sp, rep from * 2 times more, end hdc in next 2 sts, (2 hdc, ch 2, 2 hdc) in ch-2 sp, [hdc in next 2 sts, hdc in ch-1] to last ch-1 sp, join rnd with a sl st to top of ch 2. Rnd 6: with MC, sl st in next st, ch 2, working in between sts throughout rnd, hdc in same sp as ch 2, *[ch 1, sk 2 st, 2 hdc in next st] to last 2 sts before ch-2 sp, ch 1, sk 2 st, (2 hdc, ch 2, 2 hdc) in ch-2 sp, rep from * 3 times more, end ch 1, sk 2 sts, [ch 1, sk 2 sts, 2 hdc in next st] to last 2 sts, ch 1, sk 2 sts, join round with a sl st to top of ch 2. Rnd 7: with B, sl st in ch-1 sp, ch 2, 2 hdc in same ch-1 sp as ch 2, *[ch 1, sk 2 sts, 3 hdc in ch-1 sp] to last 2 sts before ch-2 sp, ch 1, sk 2 sts, (3 hdc, ch 2, 3 hdc) in ch-2 sp, rep from * 3 times more, end [ch 1, sk 1 st, 3 hdc in ch-1 sp] to last 2 sts in rnd, ch 1, sk 2 sts, join with a sl st to top of ch 2. Rnd 1: with A, ch 1, sc in same st as ch 1, sc in next st, *[sc in ch-1 sp, sc in next 2 sts] to ch-2 sp, (sc, ch 2, sc) in ch-2 sp, rep from * 3 times, end [sc in ch-1 sp, sc in next 2 sts] to last ch-1 sp, sc in ch-1 sp, join rnd with a sl st.
Rnd 2: ch 1, sc in same st as ch 1 and in ea st to ch-2 sp, *(sc, ch 2, sc) in ch-2 sp, sc in next st and in ea st to ch-2 sp, rep from * 2 times more, end (sc, ch 2, sc) in ch-2 sp, sc in next st and to each st to end of rnd, join with a sl st to first sc. Rnd 3: with MC ch 1, sc in same st as ch 1, sc in next st, *[ch 3, sc in back of second ch from hk, sc in back of next ch, sc in next st, ch 1, sk 1 st, sc in next 2 sts] to last st before ch-2 sp, ch 3, sc in back of second ch from hk, sc in back of next ch, sc in next st, 3 sc in ch-2 sp, sc in next 2 sts, rep from * 3 times, end *[ch 3, sc in back of second ch from hk, sc in back of next ch, sc in next st, ch 1, sk 1 st, sc in next 2 sts] to last st, ch 1, sk 1 st, join with a sl st to top of sc. Fasten off. This version does not have a ghost row of straight hdc stitches and follows a more standard shell and skipped stitches granny square formula for every round. Rnd 2: with MC, sl st into ch-1 sp, ch 2, hdc in same sp, *ch 1, sk 1 st, 2 hdc in ch-1 sp, ch 2, sk 1 st, 2 hdc in ch-1 sp, rep from * 2 times, end ch 1, sk 1 st, 2 hdc in ch-1 sp, ch 2, join rnd with a sl st to top of ch 2. Rnd 3: with B, [sl st in next st] twice into ch-1 sp, ch 2, 2 hdc in same sp as ch 2, *ch 1, sk 2 sts, (3 hdc, ch 2, 3 hdc) in ch-2 sp, ch 1, sk 2 sts, 3 hdc in ch-1 sp, rep from * 2 times, end ch 1, sk 2 sts, (3 hdc, ch 2, 3 hdc in ch-2, ch 1, join rnd with a sl st to top of ch 2. Rnd 3: with B, sl st in next st, sl st in ch-1 sp, ch 2, 2 hdc in same sp as ch 2, *ch 1, sk 2 sts, (3 hdc, ch 2, 3 hdc) in ch-2 sp, ch 1, sk 2 sts, 3 hdc in ch-1 sp, rep from * 2 times, end ch 1, sk 2 sts, (3 hdc, ch 2, 3 hdc in ch-2, ch 1, join rnd with a sl st to top of ch 2. Rnd 4: with MC, sl st in next 2 sts, sl st in ch-1 sp, ch 2, hdc in same sp as ch 2, *ch 1, sk 3 st, (2 hdc, ch 2, 2 hdc) in ch-2 sp, [ch 1, sk 3 sts, 2 hdc in ch-1 sp] to last 3 sts before ch-2 sp, rep from * 2 times more, end ch 1, sk 3 sts, (2 hdc, ch 2, 2 hdc) in ch-2 sp, ch 1, sk 3 sts, [2 hdc in ch-1 sp, ch 2] to last ch-1 sp, join round with a sl st to top of ch 2. Rnd 5: with A, sl st in next st, sl st in ch-1 sp, ch 2, 2 hdc in same sp as ch 2, *ch 1, sk 2 sts, (3 hdc, ch 2, 3 hdc) in ch-2 sp, [ch 1, sk 2 sts, 3 hdc in ch-1 sp] to last 2 sts before ch-2 sp, rep from * 2 times more, end ch 1, sk 2 sts, (3 hdc, ch 2, 3 hdc) in ch-2 sp, [ch 1, sk 2 sts, 3 hdc in ch-1 sp] to last ch-1 sp, end ch 1, join rnd with a sl st to top of ch 2. Beautiful blanket! I’ll be putting that on my list of to-do’s! I will be back on the 5th to see if you get a chance to post the pattern yet. Love your blog, great stuff! Rhonda shared the link so we could see the picture and I must say that it is absolutely gorgeous! Can’t wait for the pattern to be available! Thanks so very much for the pattern – it’s beautiful! Thanks for the pattern! I’m going to try this after Christmas. Thank you so much for allowing us newbie crocheters see your talented work you do. Your colors are like sunshine ~ uplifting and dynamite to look at and yet so suttle to look at. Your color choices are not overbearing which I feel will make a baby feel warm and at the same time stay warm. I want to try this pattern and allow my young granddaughter enjoy the vibrant colors as she discovers colors in her small world..
What a lovely balnket. THe square is pretty too. I like the picot very much. Looking at it I got an idea. Make squares with picots and then join the picots together to get a lacy effect at the joints. I shall try it out and see how it looks. You colours are just beautiful. Thanks for the photos and for the pattern. Thanks for the pattern laura.. i tried doing version A, but kind of got stuck, maybe i was doing something wrong.. had a question.. in the beginning of round 3, does [sl st in next st] twice mean that there two slip stiches need to be made after joining with the new color..
I’m sorry if the question is too basic.. i’m new..
Another question :Is it alright to use worsted weight instead of baby soft? 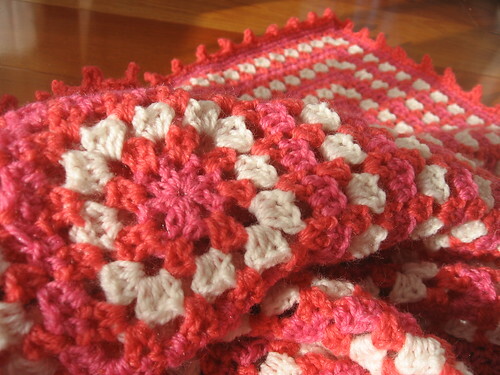 zeeny – So glad to hear you are making the blanket! Worsted weight works fine. I’d use an I or J hook, though. “[sl st in next st] twice into ch-1 sp” means, sl st in the next st and then sl st in the ch-1 space. Could you please tell me how i could make the square without the [sl st….] twice or thrice.. i seem to be going over the slip stitches to complete the round.. is that how it should be. Could you please please please point me to a similar pattern with different instructions.. because i really love this pattern and want to make it.. my baby’s due in june, and at my snail’s pace i hope to finish it by then atleast..
Am really sorry if i’m bugging u !! zeeny – Sorry to hear that you’re still having trouble. The slip stitches are necessary to keep the blanket from bunching. You will be skipping over the slip stitches to join the round, just like any granny square. My old camera is terminally broken and I’m waiting on a replacement through the mail. As soon as I get my new camera I will post a few pictures in a tutorial. If you’re having trouble, I’m sure others are also. I’m happy to help if you need anything else! Is there any other way i can mail you ? My e-mail is thekidneybean@gmail.com. Check out my “Tell Me More” page for forums I check regularly if you would rather PM me. Your baby afghan is just lovely. I have made three giant Granny-type afghans. Two were rectangles, and one was a five-sided shape. I tried starting a fourth, but was bored almost as soon as I started. This morning I found yours, and now am excited about beginning again. Thank you for the detailed instructions and clear photographs. Will keep you posted and try to put up a picture when it is finished. Thank you so much! Wow!!! 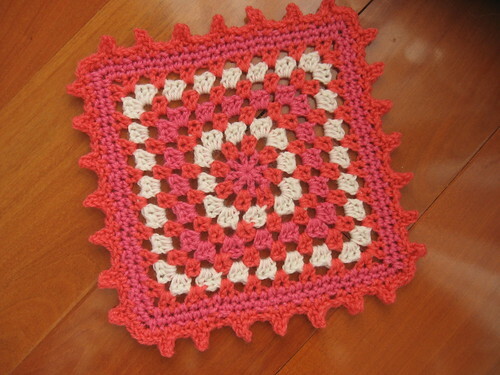 i love it, I love the colors, I have to learn to crochet granny squares… Good Work!!!! I’ll have to make this for my daughter!… It is very professional and I adore the colors you used!… I’ve acually never made anything using grannies because I hate joining them all… but I’ll do it for this blanket. Thanks for the pattern! What a fabulous pattern – thank you! I was inspired when I found it yesterday and had to jump right in. Thanks also for the tutorial, as I had a bit of trouble getting the joinings to look right at first. I have just started your pattern, and I like it. I wonder if the ch2 at the end of row 4 should be made tighter. That is the only place where there is a ch2 before a joining; the other rows have ch1. Thanks for your help. This is such a beautiful pattern and so fast to make! It’s a lifesaver, because I have two baby blankets to make this month. Thanks for the tutorial – I had some trouble at first, and that cleared it right up! Hello! We love this pattern and recently linked to it in a newsletter! We’d love to post more of your projects/use your images on our site! Let us know if this is something you’d be interested in. Thanks! HELP!!! I’ve started this over about 4 times. I can’t seem to get row 6 to be right. I know row is right, or I think it is. I slip stitch and the instruction from there to the first corner are exactly right. Then when I get to row 6, I slip stitch, chain 2 and there aren’t enough stitches to do the next set of instructions before the corner. Does that make sense? I love this pattern I think I’m going to try to do this for my cuz baby shower! Having problem getting the pattern? Please help. I love it. Its my next project for sure! IS THIS PATTERN PRINTABLE ? I would love to print this pattern…unable to print it?????? Hi!! I have a question about the amount of wool I need. I live in Argentina and here they sell wool by weight. Should I buy 141 grams of each color or about 50 grams of each? Thanks!! The pattern is gorgeous. Can’t wait to knit it for my niece, due to be born in October!! clothes, and just about anything you can purchase most importantly chain outlets such as Targeted or Wal-Mart. dealing in comparison with classic purchase autos. Traders acquire options with a hit price tag. (gross every day product) as well as buyer wasting and also new home product sales. I love the effect of the ghost row. Subtle color change is beautiful. I can easily see this becoming my “go to” pattern for baby blankets. Thanks! This is beautiful but it’s just a basic granny square and it’s not the best for a baby blanket with all the tiny holes to tangle fingers and toes. However, I would make this for lapghans at the senior centers and rehab facilities. They are easy for them ot move around with them. Thanks for sharing! Hi Karen, I believe the concern is the “tangle” of little fingers getting caught not just in a single hole but in several if you can envision that. I’ve never had kids nor have I had any experience with them so I err on the side of caution normally when making my afghans for baby showers. Except that even some of the non-granny square afghans I’ve made have some holes in them and really, by their very nature, any piece of crochet work is going to have holes. I’ve never actually heard of anyone having a problem with a child getting his or her fingers tangled in a piece of crochet work so I am grateful for your common sense comment dispelling concerns, mine or others. how can i too get this pattern?